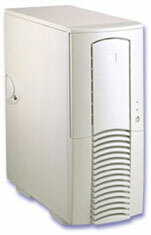 JCM Solutions offers a wide-range of business-standard work stations and servers. You can select from one of our standard models or we can build to order. From the standard business work station to the most scalable server, we can build it to met your needs. All of our computers are built with top-of-the-line name band components, and also come with a 1 year parts and labor warranty. To order please call (510) 550-4007 or e-mail us.